Having a Wedding cake is traditional, but there’s nothing wrong with a little extra sweetness on your Big Day. 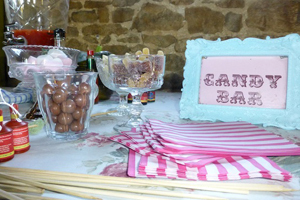 Candy bars a still a top wedding trend, especially for your Wedding favours. Choosing a selection of confections, can be a relatively inexpensive way to satisfy many a guest’s sweet tooth. If you just fancy a hiring a few vintage glass jars or would like the whole “sweet thing” including old style sweets, table signs, table cloth etc. Please do get in touch for a chat.